Fiji - The Happiest Place on Earth | Where Is Nikki? I’ve liked pretty much all of the places I have been to for various different reasons, but Fiji has to be way, way up there on my list of all-time favourites. The word “paradise” gets banded around way too often (I’m probably guilty of saying it a zillion times on this trip alone!) but if anywhere in the world is worthy of this description, then it is definitely Fiji. The scenery alone on the islands is nothing less than postcard-perfect. With a myriad of greens as the backdrop to swaying palm trees in the landscape, and the striking hues of blue sky and aquamarine sea sparkling in the sunlight, Fiji really does make you feel secluded from the rest of the world (and with no wifi on most islands, it’s the perfect place to get unconnected and enjoy a tech detox!). Everywhere you look there is something colourful to make you smile, but aside from the idyllic scenery that makes you never want to return home, it was really the locals that made it a very special place for me. I didn’t think I could meet anyone happier than the people I met across Southeast Asia – but then I met Fijians. They really are THE happiest people I have ever had the pleasure of meeting and welcome all visitors with big open arms. There’s barely a moment that goes by where you won’t get greeted by a big smile and a warm-hearted “BULA” (meaning hello, or cheers!). Their spirits never seem to be down and they are always joking or laughing about something which makes them incredibly infectious people to be around. The atmosphere is always very friendly and relaxed and you quickly adapt to what the locals call “Fiji Time” – no-one hurries in Fiji, and if something is delayed or doesn’t go as expected for whatever reason, they don’t let it stress them out. What will be, will be…just carry on smiling and all will be OK! I spent my first and final night on the mainland in Nadi (pronounced Nandy), doing a spot of island hopping in-between. Backpacking around the Fiji Islands is a unique experience – if you can really call it “backpacking”. It’s more like an organised hop on, hop off tour, with one boat making its way around the Yasawa and Mamanuca Islands throughout the day. Because the islands are so remote and accommodation is so limited, there’s not really the freedom to just show up without having something booked beforehand. So the easiest and cheapest way to travel around is to book a combo package which includes your boat pass for all journeys, your accommodation and all meals on your chosen islands over a certain period of time. In Nadi, I stayed at Bamboo Backpackers on Wailoaloa Beach, and have to say this is probably the best budget hostel I’ve stayed at during my entire trip, purely for the atmosphere and its amazingly friendly staff. This is where I first got introduced to Kava (and before you ask, no it’s not the cheap bubbly you get back at home, much to my disappointment!). Kava is a ceremonial narcotic drink that is more popular than beer in Fiji. Every night at Bamboo they would host a “Kava Party” so both guests and staff got the chance to mix and mingle, while gathered around jubilantly singing and playing music. The Kava gets passed around in coconut bowls, and looks and tastes a bit like muddy water, which probably doesn’t sound the most appetising of things! However, after a fair few bowls you start to get used to the taste and in return get a nice serene feeling (which probably explains a lot about their very relaxed attitude to everything!) Drink too much though and your mouth starts to go Novocain-numb (I learnt the hard way!) but you’re almost certainly guaranteed to have the best sleep of your life that night! After my first night in Nadi, I arose bright and early (surprisingly Kava-hangover-free) to embark on my first boat trip to the beautiful feet-sinking sands of Waya Lailai Island. Lively Fijian music filled the air as we disembarked onto the beach to a cheerful welcome from our hosts for the next few days. Being on Waya Lailai felt more like we had joined a family rather than just holidaying in a standard beach resort. Most resorts on the islands tend to be run by one big family – aunts, uncles, cousins, grandparents, children, all chip in to do their bit. Island life is mostly village based and all Fijians are strongly rooted to their culture, land and their mataqali (family). This sense of tight-knit community was evident as soon as we set foot on the island, and explains a lot about why the Fijians are so friendly and welcoming to all visitors, taking them in and looking after them as if they were members of their own family. After Nepote (the main man) introduced us to his family and let us get settled in our rooms, we spent the afternoon making bracelets out of bamboo leaves, shells and beads with some local families, chatting amiably before waving them goodbye with a thank you for our souvenirs. After that, with the sun calling out to be worshipped, we quickly put on our long-forgotten bikinis and spent the rest of the day lazing around on the beach or taking a dip in the warm crystal clear sea. In fact, the majority of my time on the islands was spent in the aforementioned manner (no surprises there! ), however myself and my new roomies (Kirsty and Chelsea – love those girls! ), did manage to break the mould the next day to go snorkelling, which was an experience I’ll certainly never forget. As we entered the water we were greeted by an abundance of colourful fish and coral reef, which was the home to some reef sharks. I’d be lying if I said I wasn’t a little nervous sharing my immediate space with these scary-looking creatures…but like the locals, the sharks seemed very friendly! After they had sussed us out a bit, they even got quite playful, swimming up close to us as we fed them some fish that one of the guides had been catching beside us with a spear. Later that afternoon we hopped in a boat to go to the other side of the island to visit a traditional Fijian village and Namara Primary School. 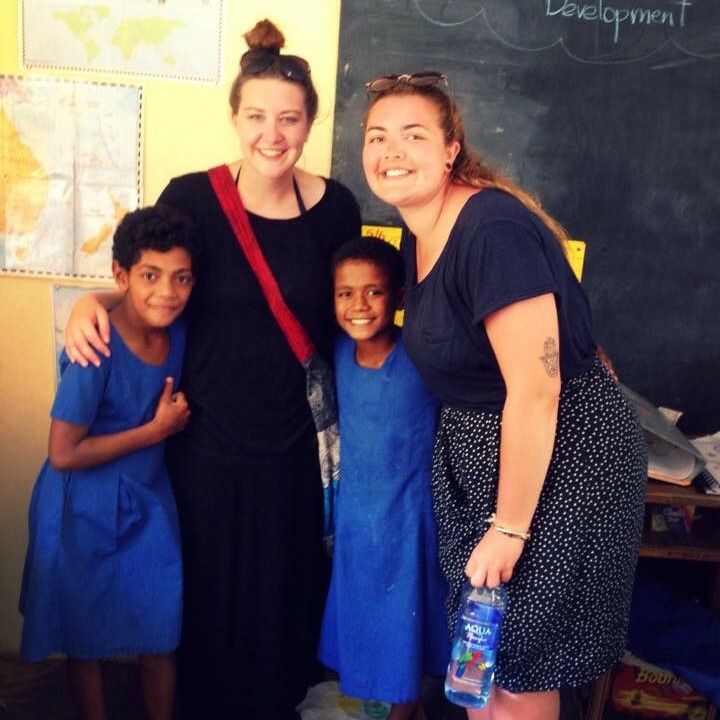 After my time in Tanzania as a Volunteer Teaching Assistant, I was really excited about getting an insight into Fijian education as well. When we arrived at the school, the children all shouted “BULA” as we entered the classroom and gathered around us with their smiling faces to sing nursery rhymes, all in perfect harmony. The boys wear smart grey sarongs topped with white shirts and the girls all wear blue smocks. After they sang, they proudly showed us their work, but seemed more interested in asking us questions about our lives back in England and seeing photos on our mobile phones. After some farewell hugs from the children, Nepote took us into the main village, where rows of tidy huts and small concrete houses filled the spaces between tall coconut palms and breadfruit trees. It was extremely quiet and the only noise we heard was the crowing of roosters as we walked around. There didn’t seem to be many people about (they must have been sleeping off the Kava) but we did get the chance to meet one elderly man who was happy to talk to us about his three very energetic grandchildren, who were clambering all over him, before we got in the boat to return back to the resort. That evening we met our new room-mates, Tom and Phaed, before heading down to the beachside decking for a night of party games and drinking the bar dry (quite literally!). The Fijians love to sing and dance, and after dinner they had us all up on the deck learning the Bula Dance. Unlike the Meke (Fiji’s cultural ceremonial dance involving symbolic movements) the Bula Dance loosely follows the structure of the Macarena, and was a brilliant ice breaker for all the new arrivals. One minute we were just chatting amongst ourselves and the next we were bumping booties with giggling Fijians, shouting “Bula” so loud you’d swear people on the next island could probably hear us. Next stop was the island of Matacawalevu, which had an even more relaxed vibe (if that’s even possible!). Our host Chris was so laid back he was almost horizontal (the epitome of “Fiji Time”) and this vibe certainly oozed throughout the rest of the island. Matacawalevu has to be one of the prettiest places I think I have ever visited. A hilly, volcanic island, it has one of the longest white sand beaches in the Yasawas. On one side you look out to the open ocean, and on the other you can bathe in the warm beautiful blue lagoon. Here nothing but more eating, drinking and sun-worshipping took place with my new friends Claire and Laura (although not as much sea-dipping, thanks to the stingrays lurking in the waters!). I think it’s fair to say I had to endure a terrible case of a hammock-coma by the time I left. My final night at Bamboo was pretty much a repeat of my first, except we moved the party to the beach where we enjoyed a cosy bonfire under the inky-starred sky (and I may have drank more than my body weight in Kava this time around!). It was the perfect end to a perfect week and saying goodbye to my new Fijian friends was a very sad day (I may have shed a tear or two at the airport…and to be honest I am still suffering from a case of the Fiji-blues as I type this…and I’ve been told I’ll never get over it!). Before I left, one of the staff spent a good hour hand-crafting a beautifully carved bracelet out of coconut, as a souvenir to remind me to come back to Fiji one day. I’m still wearing it loud and proud today, and if there ever comes a day where I’m fortunate enough to travel as far as the South Pacific Ocean again, Fiji will definitely be at the top of that list. What islands are on your bucket list? 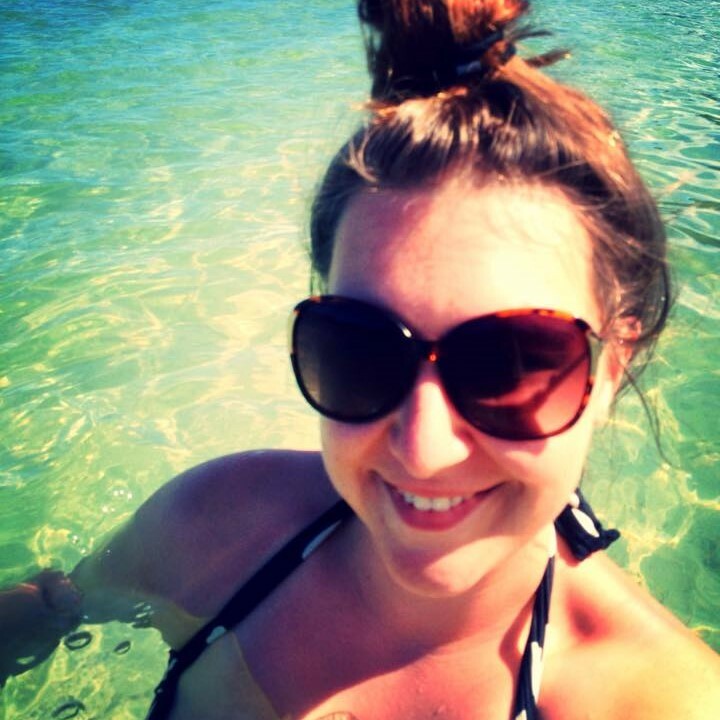 Or do you have any others to recommend to a self-confessed beach bum like myself?